Posted on April 8, 2006 by Alicia Bay Laurel	in Blog. 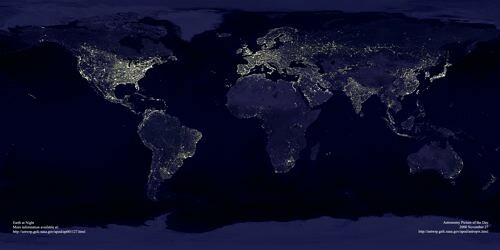 From NASA in 2000, a compilation of night time satellite photos of the earth. Most people know the earth’s supply of petroleum is declining rapidly as its energy consumption increases, especially in Asia, where economic growth is robust. Where will the energy come from to power the grid worldwide? Are there efficient alternative sources that don’t endanger life on earth with radiation or global warming? Of course there are. My question is: are the currently available alternative technologies not widely employed because they function best in supplying individual households and businesses on site, rather than in profiting multi-national corporations that create electricity in a central location and deliver it with cables? The UK is giving microgeneration a try.